Community Helpers I Have Who Has is always a fun game that keeps kids on their toes, especially this edition. 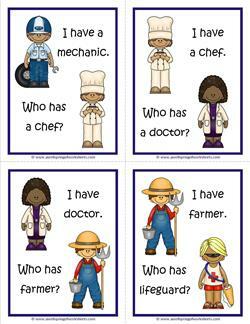 Besides using listening and reading skills, kids will use visual skills in identifying the helper on their card. 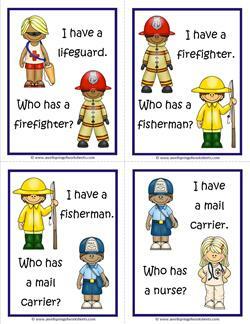 Familiarize your kids with these specific helpers by using the coordinating flash cards first. Kindergarteners will most likely need adult help with this game the first few times around. Great fun for the whole class or small groups! 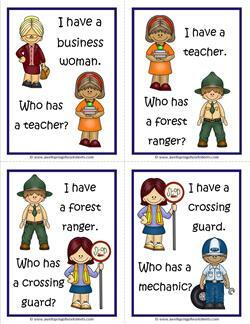 These four I Have Who Has game cards have a business woman, a teacher, a forest ranger, a crossing guard and a mechanic on them. Have fun! Page 2 of this I Have Who Has game includes the mechanic, chef, doctor, farmer and a lifeguard. Have fun listening and matching! These brightly colored workers include a lifeguard, a firefighter, a fisherman, a mail carrier and a nurse. 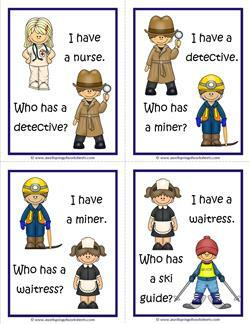 The community helpers come from many walks or life - a nurse, a detective, a miner, a waitress and a ski guide. Sounds like a game of Clue to me! 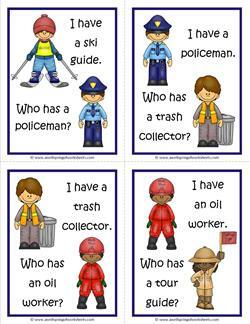 On this I Have Who Has community helpers game page you'll find a ski guide, a policeman, an oil worker, a trash collector, and a tour guide. Have fun! This last set of cards brings the game full circle back to where it started with a business woman. 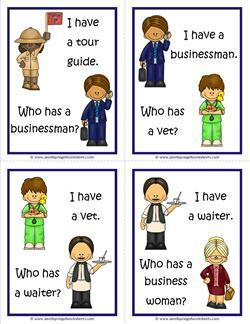 Also has a waiter, businessman, tour guide and a vet.